The time of passion belongs to the past. Love cannot be captured by image; even so, we believe that love does exist somewhere beyond image. Cinema can show those who came out through the time of passion or those who are heading toward love. Cinema, however, can never catch the time of passion or the moment of love as the present. This is the apocalyptic aspect of cinema. In Morning of St. Anthony's Day, which was shown for the first time as a closing night program for the 51st Semaine de la Critique of the Cannes Film Festival in 2012, João Pedro Rodrigues accepts this tragedy of cinema with good grace, which could be regarded as limitation that enables creation. He knows well that when it comes to making film, freedom without constraints is just an illusion. A child is taking a walk with a black dog at dawn. The sounds of birds, cars and airplanes break the silence telling that the day dawns. Even though the scene seems to be perfectly peaceful, we cannot help but wonder about the little girl, who is not accompanied by her parents, wandering with her dog around the streets of Lisbon in the gray of the daybreak. Does she leave from some place or does she head toward somewhere? Beyond the child walking on the street, Alvalade Square and the strut of St. Anthony’s statue are partially shown. The bronze statue of St. Anthony which is supposed to be outside of the upper part of the frame is not shown yet. In the 4-channel installation version of Morning of St. Anthony's Day, which was reconstructed from the Cannes-premiered theatrical version, Rodrigues puts this image ab initio. The images of the little girl passing through Alvalade Square with her dog appear on four screens consecutively. The spectator can easily recognize that the image on each screen was recorded at different times. While the first image is still slightly covered with a veil of the darkness, the morning atmosphere becomes gradually obvious in the consecutive images. The third image was selected for theatrical version. In this installation version, Rodrigues also has utilized many outtakes which were not used for theatrical version. Therefore, the installation version might be regarded as the “phantom” of the theatrical version. But even so, it rather becomes a critical work that exposes the conditions of filmmaking by embracing the temporality excluded in the film itself. This is typically a preferred way of cineastes, when they conceive exhibitions related to their own film, but we should not overlook the particular story only found in this video installation, which is created by consecutively presenting four images seemingly similar but filmed at different times. The little girl might be hovering around the statue of St. Anthony in Alvalade Square. As an image itself does not contain any information on how it was recorded, it can be inserted into a new constructive context at any time. St. Anthony, who is also a patron saint for lovers, and a little girl hovering around the statue with her dog make people think that the scene is almost mythical. In Morning of St. Anthony's Day, the little girl with a dog is, to be sure, one of the figures who belong to the most special time. 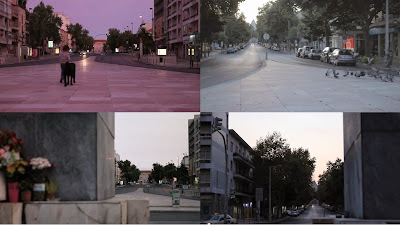 While three screens show the landscapes around Alvalade Square in the early morning, one screen shows the girl walking with her black dog on the street lit by the dim glow of the streetlights (See [Picture. 1]). The girl, who is a guard of the nightly time for passion, will disappear to some place unknown when morning comes. At least we can get a hint that those young people are on their way back home after enjoying St. Anthony’s Day all through the night. That is because of a basil flower pot on the hand of a guy. The basil flower pot, decorated with a paper carnation and a small flag with lines of poem, is a token of love which is supposed to be exchanged between lovers on June 13, St. Anthony’s Day. 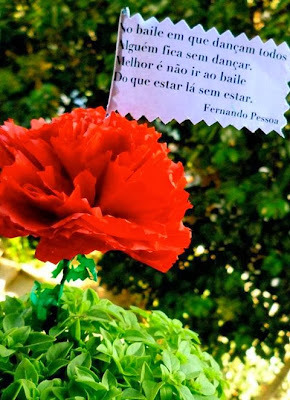 At the end of Morning of St. Anthony's Day, then and but not till then we can read the untitled four-line poem on the small flag, written by Fernando Pessoa. "At the ball where everybody dances, someone's left out. It is better not to go to the ball rather than to be there without being [to be a non-existing person there]." (See [Picture. 2]) Why does he still have the basil flower pot? Didn’t he find someone to deliver it to during the night party? Or is he on his way to give it to someone at this belated time? The poem doesn’t give any answer to many riddles summoned up by Morning of St. Anthony's Day but rather leads us to think that the time for party, passion and love might not yet have arrived for the young people. Being totally exhausted, they might be now slogging their ways searching for an uncharted dancing party. Even though they know that they would “be there without being [be a non-existing person there]” like ghosts, they are heading somewhere. Or, they might be already ghosts. The drawings of João Rui Guerra da Mata, which are exhibited along with the Rodrigues’s installation, show a utopian ghostliness which grabs the dreams of these powerless zombie-like young people. More than ever, Rodrigues emphasized the seductiveness of hors-champ. Like the pied piper of Hamelin, the hors-champ area seduces the young people with mysterious attraction, and sure enough, some of them disappear into water like the mice that followed the piper. By the way, the attraction works not in a mysterious way but in a secular way. At a certain point in the installation, three young people are checking their mobile messages at the same time. We never know the messages but we can see a young woman in a dress staring at her mobile phone all the time. In the end, she disappears into the water. She wasn’t attracted by any mysterious power but she did follow a “call”. What on earth is the “call”? It is not long before the face of St. Anthony’s statue fills the screen. The paper carnation with the small flag on which a poem is written is presented on another screen. The basil flower pot and the young man aren’t seen anymore. As the wind blows, the paper carnation disappears too. The ending of installation version is quite different from that of theatrical version. In installation version, we never know what happened to the young man with the basil flower pot. The figure of young man getting angry after realizing that there is no subject of gaze except the silent statue is replaced here with the serenity of two empty and black screens. Even his last passion, which he spewed desperately in theatrical version, disappeared without a trace. Still, love exists somewhere beyond. Love belongs to the time of phantoms.